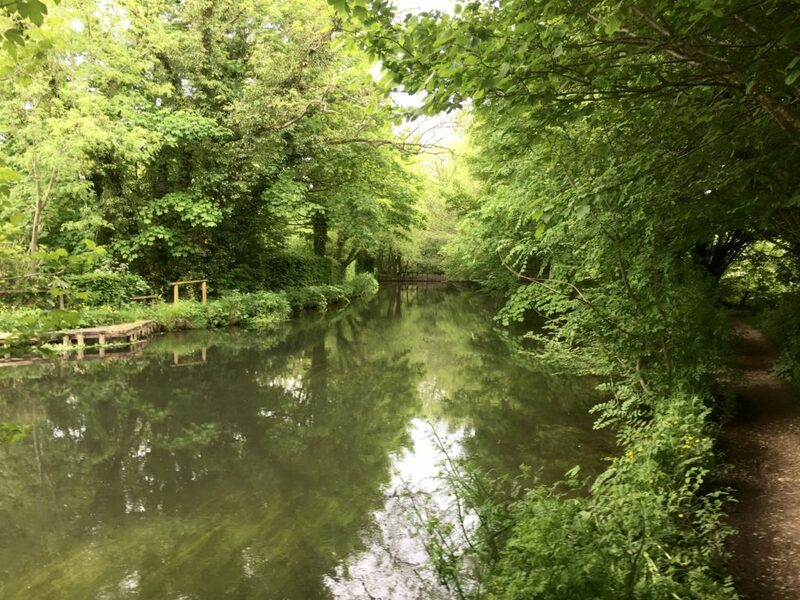 The Itchen rises near Cheriton in the middle of the county and runs for almost 30 miles across to the roman city of Winchester and then down to Southampton Water. 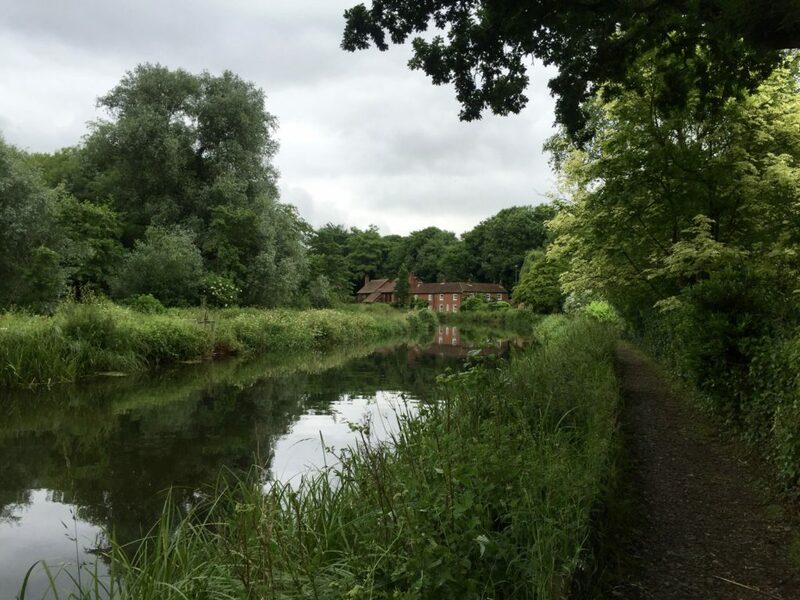 The towpath of the disused Itchen Navigation, which was a canal system that linked Winchester to the sea until the late 1800s, accompanies the river for 11 of those 30 miles. This means there are plenty of walking routes along this Site of Special Scientific Interest (SSSI) to explore. If you’re lucky, you might even see a water vole, heron, kingfisher or an otter along the way. As a big fan of the outdoors and owner of a restless Border Terrier, I’ve walked stretches of the River Itchen many times. I even walked the entire length of the Itchen Way long distance footpath in a day in 2016. 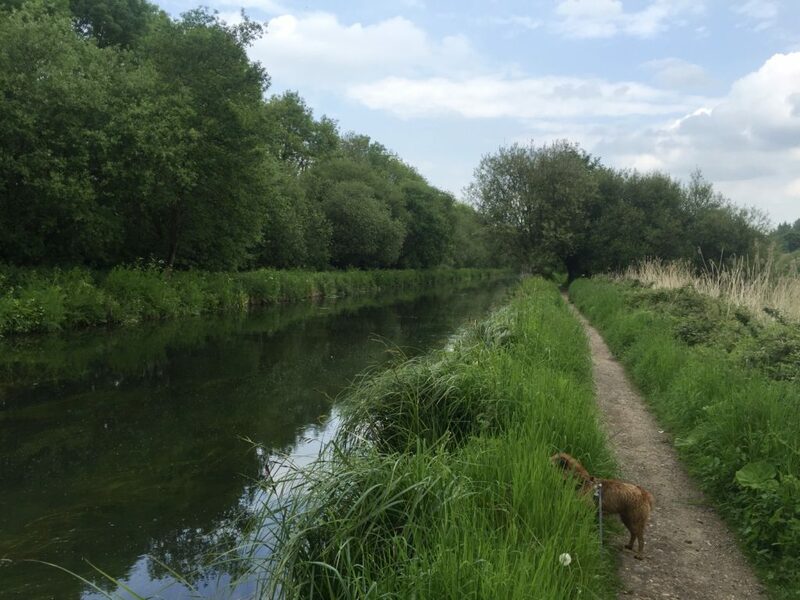 Here are five of my favourite Itchen Navigation and River Itchen walking routes. Four of them are circular walks within the South Downs national Park boundary. There’s something for all ages and most abilities, including kids. Each walk includes detailed directions and a map. The villages of Itchen Abbas and Avington are situated on the first half of the river, a few miles east of Winchester. 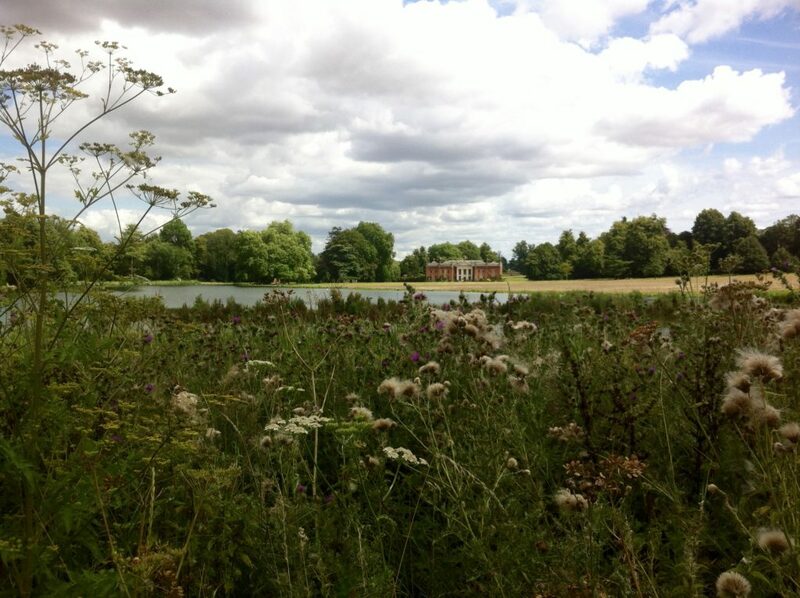 Through the reeds and beyond the water is the Avington Park stately home. The Itchen, which you can’t see from this point, supplies water to the pond. You then head west along a quiet park lane to a track past the park lodge and cattle grid that prevents the estate’s Highland cows from wandering. This that takes you through a marshy area and over a few streams to a bridge over the main river channel. From there, you head back east picking up the Itchen Way. Most of this section is a pleasant walk aside a ridge looking over the river. 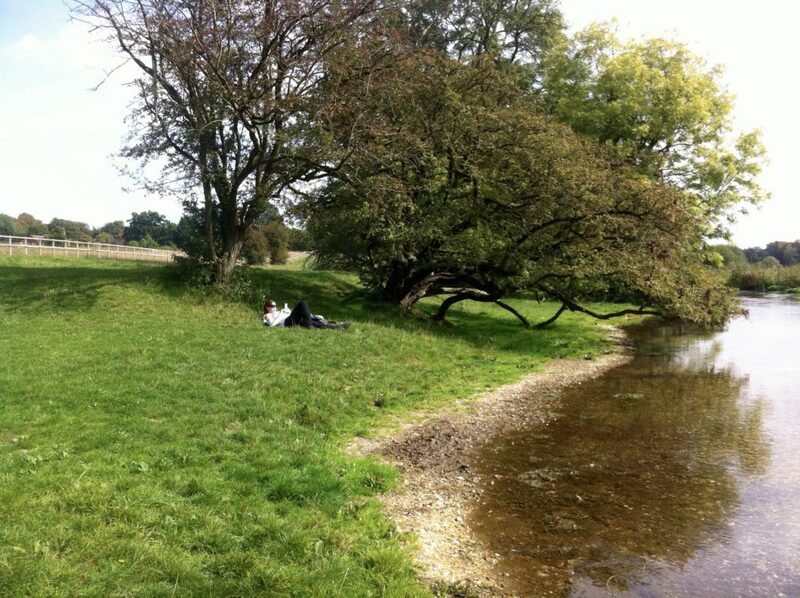 There’s also a sheltered spot close to the river’s edge, ideal for a picnic or an afternoon siesta in the sun. When you reach the church at Itchen Abbas, you follow the tree-lined road back to Avington. This takes you over several channels of the river including the one that feeds Avington Pond. There’s an old river mill and some waterfalls along the way. Before you reach the village of Avington you pass the main gates of the Avington Park house. This attractive stately home was built in the late 16th century. 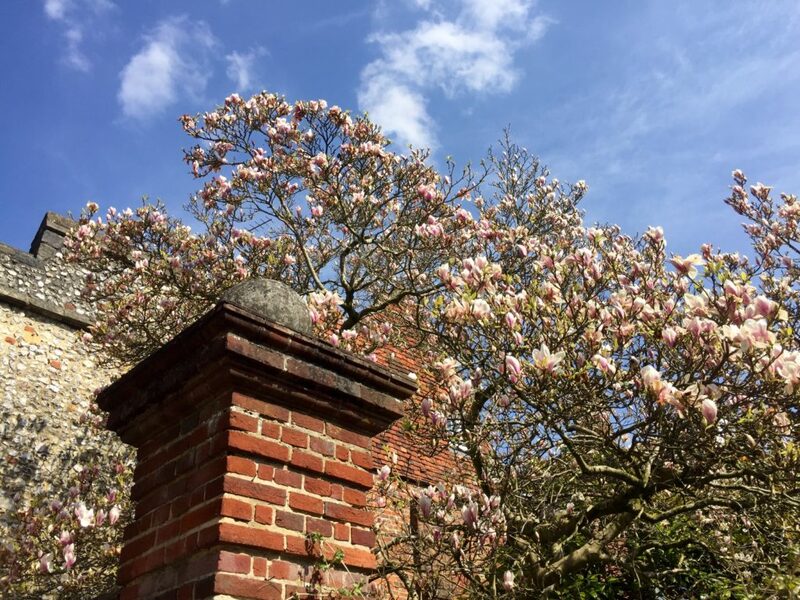 The house and grounds are open on Sunday and bank holiday Monday afternoons in the summer. Soon after the road heads east you’ll enter Avington village with its wisteria-covered red-brick cottages and cute castle-like church. The church’s pews are supposedly made from mahogany gathered from Spanish Armada galleons. On the way out of the village, you take a right-turn that takes you back to the car park at “Low Grounds”. You can park in the car park that overlooks Avington Pond. The Plough Inn (01962 779191), where the workers featured in the Avington Pond folk song supposedly collected their wages, is a few hundred yards from the church in Itchen Abbas. Head west from the car park along the road (with the pond on you right) for just under 1/2 mile. Take the track on your right. After 1/4 mile you get to a bridge over the river and some houses. 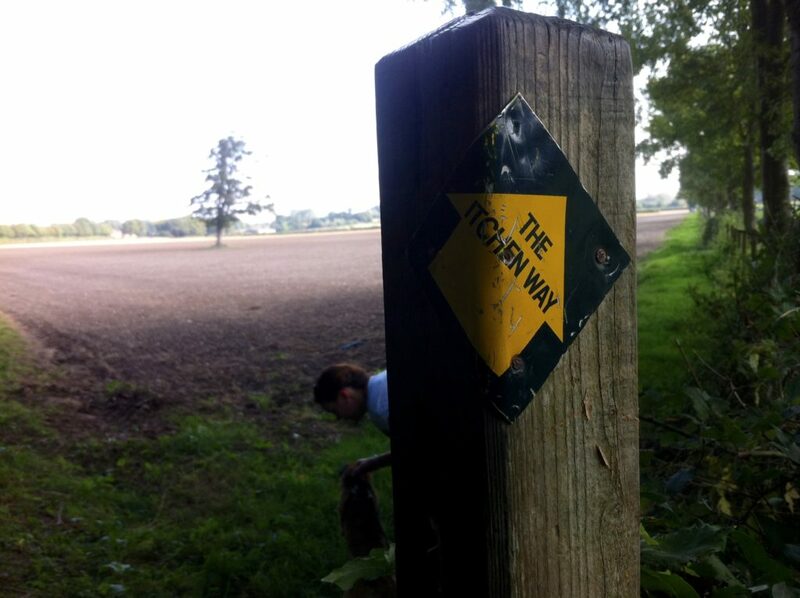 Take the footpath on the right signed “Itchen Way”. Follow this path, ignoring the path on your left after about 1/4 mile. After 3/4 mile you’ll get to the road and church. Go right. 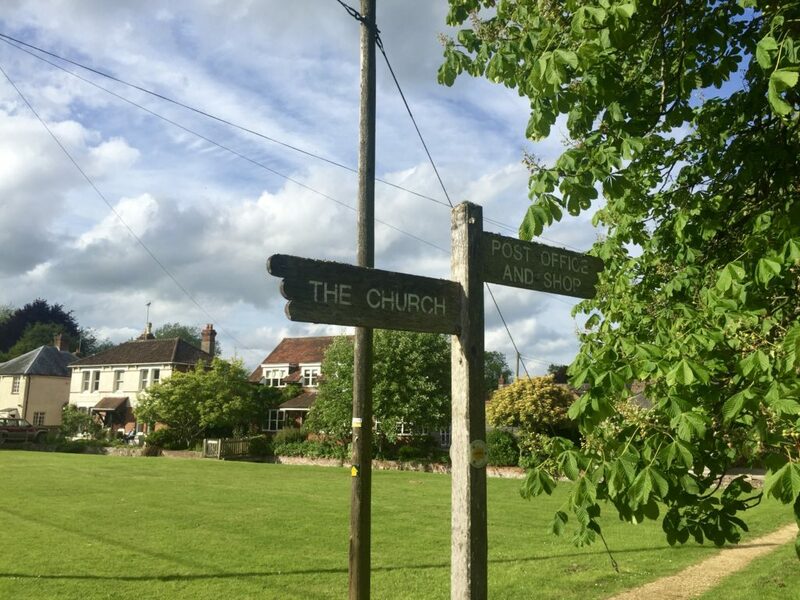 Follow the road for 3/4 mile through the village of Avington. Go right at the road that’s signposted “Easton”. That takes you back to the car park. The Itchen Navigation runs from Blackbridge Wharf in Winchester down to Woodmill in Southampton. Most of the disused navigation is still running water with waterfalls and sluice gates replacing the locks. This walk is along a section of the towpath between Bishopstoke and Shawford. Unless you want to walk there and back it’s best to park at Shawford and catch the train to Eastleigh. The first section of the walk from Eastleigh station to the river at Bishopstoke isn’t the most attractive. Fortunately, the rest of the route back to Shawford is rather lovely. The first stage of the walk is under some trees alongside the navigation. After a short stint along the river proper, the navigation and towpath then branches off to the left, arcing under the railway. After you cross the B3335 road at Allbrook, you continue north along the towpath. This is a stunning spot when the leaves are turning in the autumn months. Along here there are a few bridges over some sluices that send water from the navigation gushing into one of the channels of the river proper, which is below you on the right-hand side as you close in on the hamlet of Brambridge. At Brambridge, you cross another road and continue along the tow path on the west side of the navigation. Because the water is backed up behind another disused lock, its flat and calm here with baby fish sheltering near the banks in the warmer months. When the navigation merges with the river again for a couple hundred yards, you pass Otterbourne Treatment Works. Don’t worry, this isn’t a sewerage plant but the spot where Southern Water collects water from the river and turns it into drinking water for people in Southampton. The intake, which the footpath crosses, can take up to 45 million litres of water a day. The area by the treatment works is a surprisingly pleasant spot with a bench and dog dips, ideal for canines and humans alike to have a paddle. The footpath leaves and then returns to the water’s edge as you get closer to Shawford. And there are glimpses across to the main river as it snakes through the nearby fields. At Shawford, the path passes behind some cottages that back onto the navigation before you reach the High Street. Park in the High Street in Shawford or in the Shawford Down car park, which is under the bridge and a little way up the hill out of the village towards Compton and Winchester. There’s a restaurant and carvery at Brambridge Garden Centre (01962 715 927), a few hundred yards from the route at Brambridge. And there’s the Bridge Inn pub (01962 713171) in Shawford, between the navigation and the railway station. Head right out of the main entrance to Eastleigh station and follow the road as it loops back over the railway bridge with the station on your right as you cross. Follow this road for about 1/2 mile until you reach the sign for “Bishopstoke” at the playing fields. Take the path left along the river marked “Itchen Way”. You can now follow the marked Itchen Way path all the way back to Shawford. Stay right when the path splits after Brambridge. In the early autumn of 1819, romantic poet John Keats spent a few weeks living in Winchester. It was here he wrote his poem, “Ode to Autumn”. Many believe he found the inspiration for this composition on his walks through the water meadows to St Cross on the outskirts of the city. The first section of this walk includes the route he would take, known locally as “Keats’ Walk“. It also passes the Hospital of St Cross, Winchester College, the cathedral, part of Winchester’s medieval High Street and the start of the Itchen Navigation. It begins on Five Bridges Road, a few moments’ drive from the M3. Once a busy road, this is now a quiet dead-end and a handy place to park the car. 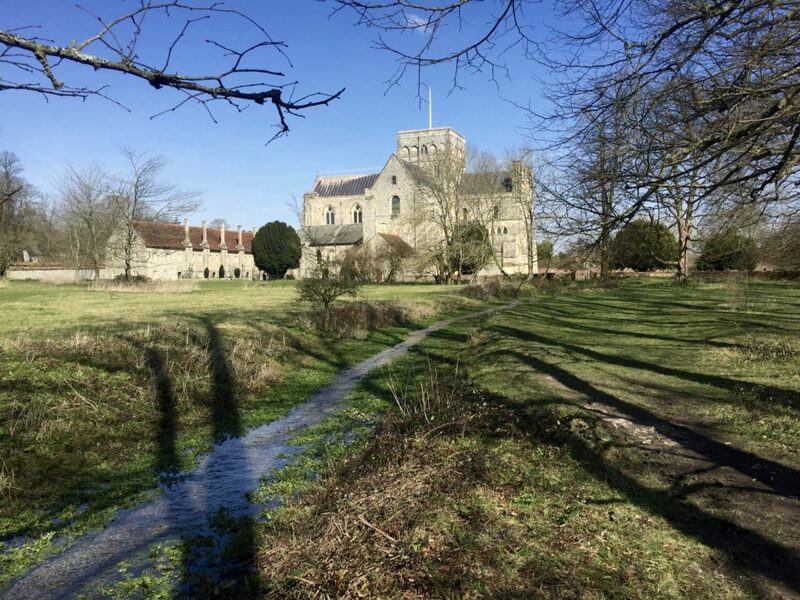 You then follow one of the Itchen’s feeder streams to the fields surrounding the beautiful Hospital of St Cross almshouse. An avenue of tall trees leads you to the back of its 12th century church, which looks like a mini-cathedral. Behind the church, the river appears on your right-hand side. There’s then a path that takes you along one of the river channels to Garnier Road. Cross here to reach a path that splits the faster-moving river on one side and a calmer man-made channel on the other. The path ends in the streets surrounding Winchester College where you pass sights such as the medieval city walls, the ruins of Wolvesey Castle, the house where Jane Austen spent the final days before her death and the magnificent arches of Kingsgate. This is one of the two remaining gates to the ancient city and has a small church across its span. You then pass through Prior’s Gate, past the timber-framed Cheyney Court and into the cathedral’s “Inner Close”. The arches of Curle’s Passage at the side of the cathedral lead you to the “Outer Close” at the front of it. Walk past the cathedral doors and you soon reach the city’s medieval High Street, where you can pick up a bite to eat or browse the shops. You then head towards the bronze statue of King Alfred the Great at the bottom of the Broadway, which also includes the neo-gothic city Guildhall and the pretty Abbey Gardens. Past King Alf’s statue is City Bridge, built over the Itchen in 1813, as well as the restored city mill. You then head along “The Weirs” – a pleasant promenade and gardens that sits between the remains of the city walls and the river. When the water disappears under a converted warehouse, you cross the river and continue along Wharf Hill. 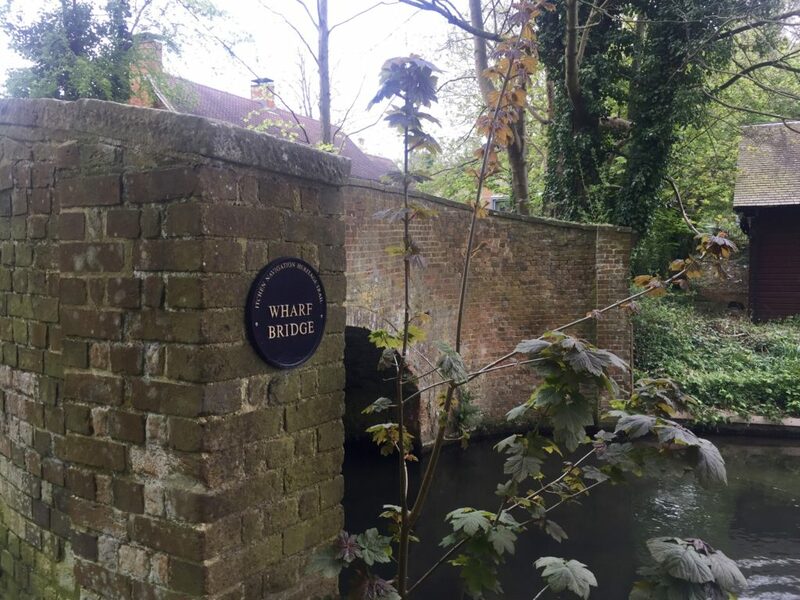 This is so called because it leads to the site of Blackbridge Wharf, which was the start of the Itchen Navigation to Southampton. You can then accompany the first stage of the navigation as its lazy waters slide through weeping willows away from the city. After you cross Garnier Road again, the towpath continues beside the route of the Didcot, Newbury and Southampton Railway under the shadow of St Catherine’s Hill nature reserve. There are great views of the city and the water meadows if you have enough energy to take a detour up the hillside. Until 1995, the busy A33 also shared this part of the route. Now the road has been restored to nature and the hum of traffic has been replaced with the sounds of birds chirping, entwined with the occasional bell ring from a passing cycle and the thud of the oars of the rowers who use this stretch of water for practice. The last part of the walk is on the now-closed road that leads you back up to your jump-off point, where you cross the river one last time at St Cross Bridge. There’s plenty of free parking on Five Bridges Road. Alternatively, you can in the city centre and do the walk from the the statue of Alfred the Great. There are scores of pubs, restaurants, cafes and food stalls in the centre of Winchester. The Black Boy (01962 861754) and Wykeham Arms (01962 853834) are two particularly interesting pubs. On Five Bridges Road, take the first track on your left as you head away from the main road. This leads to a footpath after a few yards. Follow the stream on your left-hand side until you reach the walls at the back of the Hospital of St Cross. Follow the path that veers slightly to the right to a gateway at the end of the field. When the path reaches the next road, follow the road right, then go left and left again onto College Street. When you see the Wykeham Arms pub, go right under the arch then under the next arch. Head for the left-hand side of the cathedral and go up the passage beside it. When you reach the front of the cathedral, go right until you get to the High Street. Head down the High Street towards the statue of King Alfred. Walk past the statue until you reach the Bishop on the Bridge pub. Go right along the river. Cross the river on your left when it goes under a building. Then head right. When the road bends to the right, keep going straight along Domum Road. Take the second public footpath on your right. This takes you to the water’s edge. Alternatively, walk to the tennis courts at the end of the road and then go right across the playing fields. Now follow the path for just over a mile. This goes over another road, through a small car park and then breaks off into two paths after about half a mile – you can take either route. A little while after you pass under an old railway bridge you’ll see the ramp leading to Hockley Viaduct – take the road that cuts through the old railway embankment on your right. This goes back to the start. While the job title of “drowner” might raise a few eyebrows nowadays, these people were a common sight on the Itchen in days gone by. This is because it was they who worked the river’s many water meadows. Water Meadows are areas of grassland that are irrigated using water from a river. This reduces the effects of frost in the winter and stops the ground drying out in the summer. This means the meadows are available for grazing for longer. It also increases hay production. 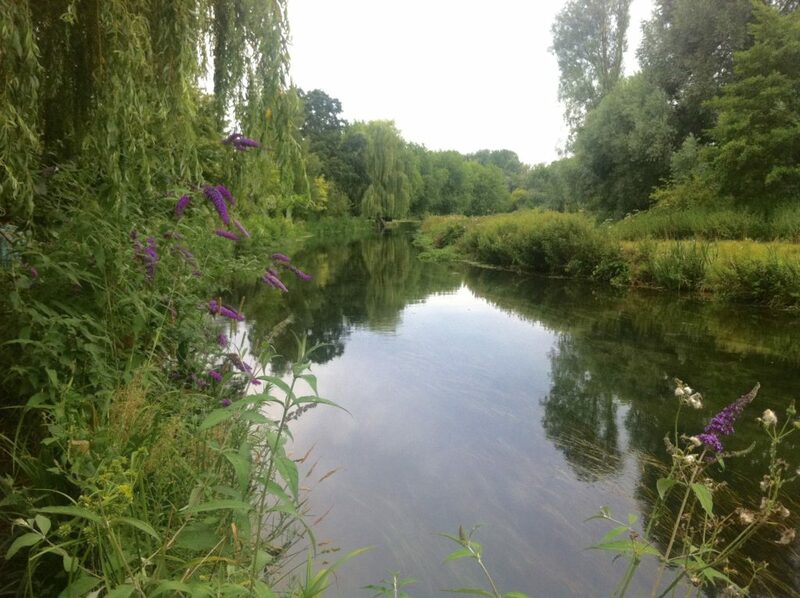 There are many water meadows along the Itchen, including at Winchester, Hockley and Avington. 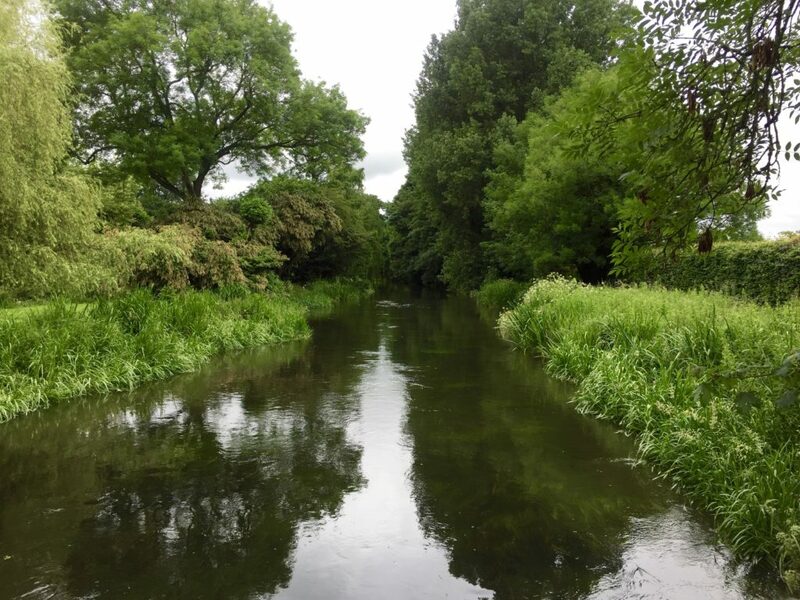 One of the most accessible and best preserved Itchen water meadows is Twyford Meads between Shawford and Twyford, a couple of miles south of Winchester. There’s a lovely walk across the meadows from St Mary’s Church. This is a great one for kids because they can paddle in the meadow’s channels, which usually have just a few inches of water. On spring and summer mornings and evenings, the bridges over the main river are also great for watching trout jumping out of the water to feed on flies and nymphs. From the path that leads from the church, you cross the main river and then walk across the meadows to Compton Lock on the Itchen Navigation. This disused lock is a popular spot for swimming in the summer months because it’s quite deep and easy to access. Here, the parish council have also restored part of the meadow so you can get an idea of what it would have been like in its heyday. 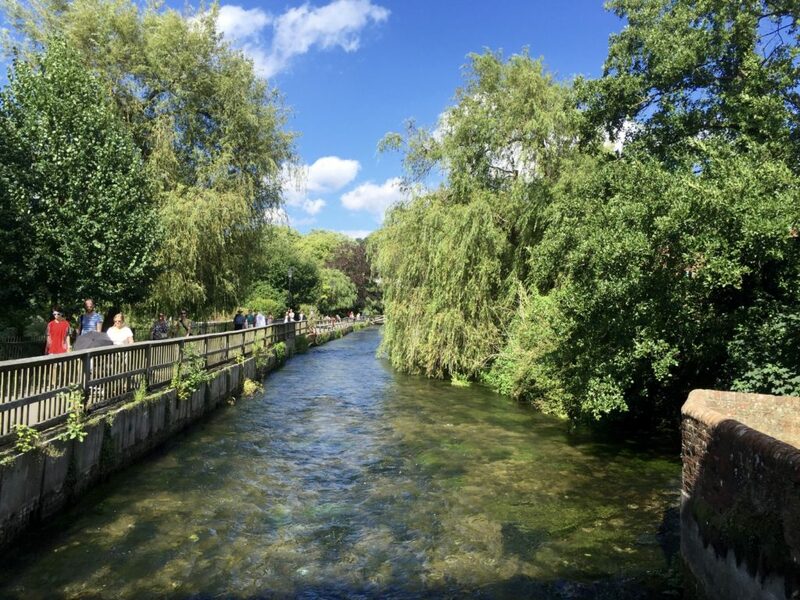 The system is based around an artificial channel called a leat that takes water from the Itchen Navigation and sends it across the meadow via a series of smaller channels, which run along the top of ridges. When the meadows required watering, the drowners would block the channels with turf to make them overflow so water runs down the ridges to water the grass. It would then run into drainage channels that lead to the main river on the other side of the meadows. From the restored area at Compton Lock, you then walk back across the meadows to another bridge over the main river. From there, it’s a short stroll back along a quiet lane past the 18th century Twyford Lodge to the church. There’s a small car park at St Mary’s Church, a few hundred yards from the river. Alternatively, you can catch a train to Shawford and get to the meadows along the Itchen Way footpath. There are two pubs in Twyford – The Phoenix Inn (01962 713322) and The Bugle Inn (01962 714888). Winchester is a couple of miles north. From the car park, follow the track down to the river. Cross the footbridge, go through the gate and follow the path that runs through the right-hand side of the field. 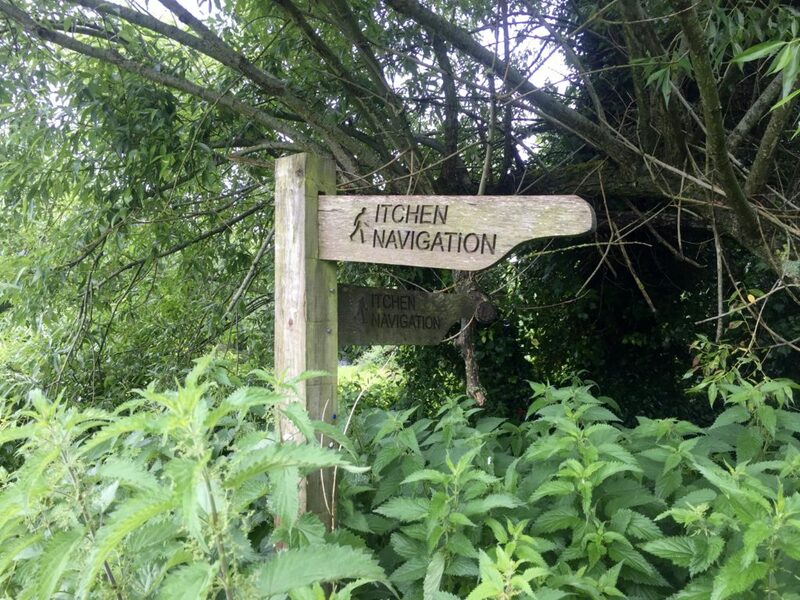 Go through the gap to the next field and over to the Itchen Navigation. Facing up stream, take the other path on your right, back across the meadows. Cross the river bridge and then go right along Church Lane. This takes you back to the church. Cheriton is one of the first settlements on the River Itchen, only a mile or so from its main spring. As such, the river is not much larger than a stream here. This walk starts in the village centre where a couple of feeder streams from other nearby springs converge with the river. You then leave the river temporarily to pass through the wild flowers of the churchyard of the 11th century St Michael’s Church to Hill House’s Lane. Then there’s a footpath through a lush, shallow valley towards Tichborne. Along the valley, the river appears again on your right where it eventually flows under and beside Cheriton Mill, which is now part of a respectfully restored office complex. You then cross the river on a road bridge and take an ancient lane up to the brow of the hill overlooking the Itchen Valley, before making your way back towards Cheriton along another medieval lane. Near the site of the Battle of Cheriton, which took place in the Civil War in 1644, you rejoin an earlier section of the Itchen Way. This takes you back down into Cheriton. There’s plenty of parking space, away from people’s houses, in the centre of Cheriton. You can also get the 67 Winchester-Petersfield bus, which runs through the village. You can’t beat a post-walk drink in the Flower Pots Inn (01962 771318), which serves beer from its on-site microbrewery. Head up the church path off the main road near the village green. When you get to the church, go right and follow the path along the boundary of the churchyard and then along the boundary of the next field. At the road go left and then right after the stable along the path marked “Itchen Way”. Follow the path for just over 1/2 mile until you reach the old mill. Go right at the road and then cross the main road and head along the track, up the hill. When you reach the next track, go right. Stay right at the junction with the next track and cross the road. About 1/3 mile after the road you’ll reach a section with a path signposted “Itchen Way” on your right and a track to your left. Take the path back towards the village. After the path goes right then left to dodge a field, stay left until you go between some gardens and end up back in the village. On the road, go right, then left, then left again until you reach the village green. The walk from Eastleigh to Winchester is one of my favourites. I’ve recently taken up running and considering running from Shawford to Eastleigh as a future venture.